For animals that yak as much as people do, a little dog barking really sends you over the top! What’s the big deal about us sounding off a bit? Oh, well, if our conversational tones don’t resonate well with you, there’s lots you can do to keep the doggy vocalizing to a minimum and make everyone as happy as clams. If we’re barking, it’s usually for a reason, so it can be helpful to know why (although not always!). Some kinds of dogs tend to bark more than others. Little herding dogs like Shelties, Australian Shepherds and Border Collies can really raise a ruckus when they get over-excited. Any of us may bark to scare off intruders, like strange people walking past our houses or cars. Other times, we use barking to let you know something’s scaring us, like strange things we see on walks, or when we find something’s not the way it ought to be. It’s just our way of letting you know something’s wrong, and maybe looking for a little back-up! If we don’t get enough exercise or our social life’s a bit too boring, sometimes we’ll use barking to help break things up a bit (hey, we can only do what we know! ), or to get a little attention. Some of us even just bark because we LOVE barking (don’t you know anyone else who just loves to hear themselves talk?). So if your dog is barking for attention, well, then, don’t give him any! How easy is that? Most dogs count your yelling back as attention, so if you’re trying to yell something to make the bark stop, you’re actually playing right into your dog’s paws! If your dog isn’t getting enough exercise or has an unsatisfying social life, then an extra walk every day would help a lot. Or maybe an occasional trip to day camp would break things up; running with the other dogs is great exercise and hanging with friendly humans and dogs is a great way to spend the day. 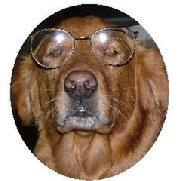 Take your pooch pal to a good training class; a little mental stimulation goes a long way to alleviating boredom. 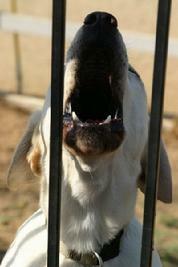 Barking at sounds, like cars going by or doorbells ringing, can be a bit more challenging to tackle on your own. But the good news is with a little help, most barking problems can be silenced pretty easily without hurting anyone’s feelings. If you’re stumped by a barking problem, call Barbara at 951-283-2101 and get started on a customized plan to restore the peace today!